Coastal communities in the Southern United States are frequently impacted by flooding from storm surge, rain, and tides. To help monitor and enhance flood emergency preparedness, the Virginia Institute of Marine Science (VIMS) at the College of William & Mary has been providing tidal forecasts since 2012 for a dozen locations in the lower Chesapeake Bay through its VIMS TideWatch Network. To expand and enhance these capabilities along Virginia’s seaside Eastern Shore, VIMS developed StormSense. The StormSense project works closely with coastal local governments leveraging a network of Internet of Things (IoT)-enabled water level sensors, VIMS’s hydrodynamic flood modeling and forecasting capabilities, and the VIMS TideWatch Network to improve flood resilience in the region. Through this collaborative approach, StormSense seeks to enhance a community’s capability to effectively prepare and respond to the impacts of sea level rise and coastal flooding. Initially funded by the National Institute of Standards and Technology (NIST) through a 2016 Replicable Smart City Technologies grant, the StormSense project was designed as a prototype for the City of Norfolk, VA, but this replicable low-cost flood monitoring solution has since been employed in other coastal communities in the region, including Newport News, Virginia Beach, and Portsmouth. StormSense leverages the region’s four long-term water level sensors installed by the National Oceanic and Atmospheric Administration, the 18 water level sensors added in 2015-16 by the US Geological Survey to the Hampton Roads region’s regional system, and 28 water level sensors installed by StormSense in the Cities of Virginia Beach (VA), Newport News (VA), and Norfolk (VA). StormSense’s addition to the existing network of federally operated sensors doubled the number of publicly accessible water-level sensors in the region. This extended monitoring system further adds value to regional resilience efforts through VIMS’ 36-hour automated tidal forecasting system, Tidewatch. 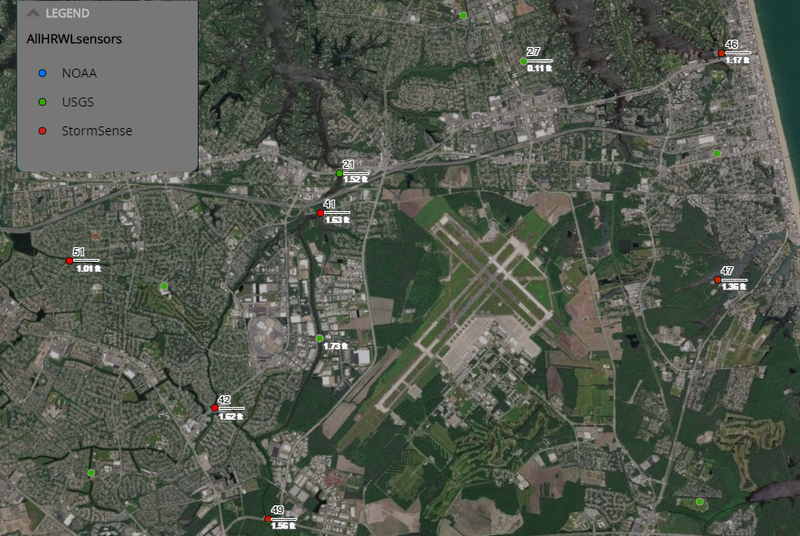 StormSense’s gauges in Newport News and Virginia Beach are currently in the process of a phased release, and ten of the new sensors’ forecasts became available the week before Hurricane Florence made landfall on the East Coast of the United States. The remaining sensors continue to be released weekly and will be accessible through Tidewatch this fall. The 36-hour tidal forecasts are updated hourly and incorporate surge guidance. StormSense has been developed on the Amazon Web Services (AWS) Cloud. The system leverages multiple AWS tools and services and acts as an integrated platform, which provides users with access to flood-related information. This includes regularly updated interactive web maps that show StormSense’s real-time water levels, which are updated every six minutes via cellular broadband. 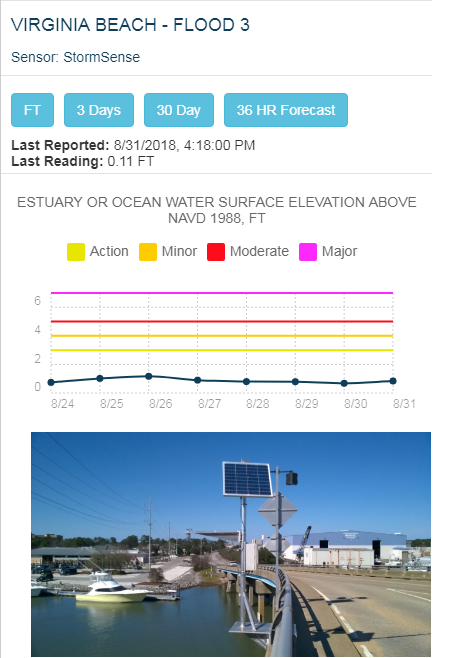 The solution also aggregates near-real time water level observations from the USGS and NOAA, which are updated hourly for federal sensors communicating via satellite. Soon, users will also have access to 36-hour tidal forecasts in the same platform. This data aggregation helps paint a clearer picture of where flooding is happening and where it is likely to happen. The service shares data through web maps interactively and is powered by AWS via StormSense’s Leaflet App and ArcGIS online. The use of ArcGIS supports further interoperability with other geospatial data services in the cities and enables easier comparative analysis with other data layers. One key feature of StormSense is its automated threshold alerts. These are powered separately from the flood mapping services through one of Valarm’s cloud tools. Valarm, an abbreviation for “Virtual alarm,” leverages IoT technology and Amazon Simple Email Service (SES) to send automatic email alerts when sensors reach a pre-defined threshold established in the cloud. These flood threshold heights are defined based on LIDAR elevation records and flood models, and help estimate the anticipated impacts of flood-related events. In addition to automated alerts, StormSense offers voice-querying functions. These services leverage Amazon EC2 instances and a sequence of AWS Lambda chains to provide up-to-date water level information. The water levels, along with any other flood-relevant data (such as rainfall, wind speed, and direction) can be requested through a compatible smart home device. Additionally, the StormSense Alexa Skill can be queried via Amazon’s Reverb app, which adds Alexa’s voice-assisted functionality to compatible mobile devices (iOS/Android). For example, a user can request water level information at a specific sensor. A typical response may be: “As of 1:54 PM on August 31, the water level is 1.34 feet at London Bridge Creek near Dawdley Corners, according to StormSense.” This lets the user know where, when, and what flood-related parameter is being returned and from which network. Future developments of the StormSense system plan to add location services to the Alexa skill so that users no longer need to be familiar with sensor locations or know their name in order to access timely water level observations for their geographic location. In addition, the project plans to extend its capabilities by adding 36-hour tidal forecasts to the Alexa skill to report the highest water level expected over the next 36 hours based on the VIMS’ Tidewatch service. The next development steps for StormSense include leveraging data hosted on the AWS Open Data Program to further enhance and validate the application’s modeling capabilities. Specifically, the team plans to compare its hydrodynamic modeled stream flow velocities with NOAA/NWS’s National Water Model, and ingest data from the ECMWF ERA5 weather forecasting model to compare and characterize wind tides in Virginia Beach, VA, USA. StormSense real time water level data map in Virginia Beach, VA on August 31, 2018 at 2:15 PM EDT.